For general range top cooking —making soup, potatoes, pasta, rice, and beans— the Turbo Pot® FreshAir™ 3.5-quart Casserole Pot is a smart choice for the modern chef and gourmet. 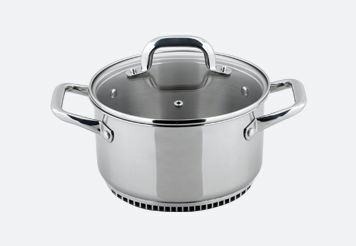 The FreshAir™ 3.5-quart Casserole Pot is constructed of durable 304-grade stainless steel and is engineered to outperform the competition. The patented heat exchanger lets you cook like a professional chef at home by dramatically improving the heat transfer between the burner flame and the bottom of the pot. Your food heats up faster while you save time and energy. 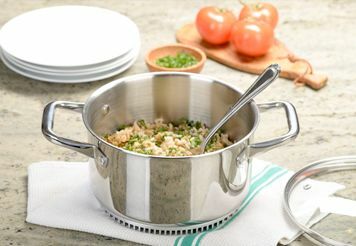 Turbo Pot® heats up quickly and evenly in close to half the time of standard pots. 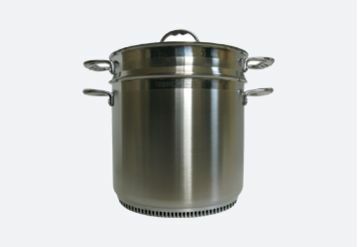 The highly conductive aluminum heat exchanger at the base of the pot offers superior heat distribution over the aluminum core designs of traditional plied cookware. 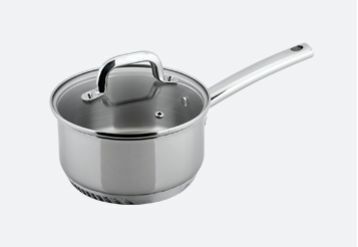 This improved heat transfer reduces hotspots near the base of the pot and is capable of reaching a vigorous boil even at lower burner settings. As the energy efficient fins channel more heat inside the pot, less escapes around the sides: intelligently minimizing unwanted heat gain to the handles (or into your kitchen!). The hollow design of the handles further aids in keeping them cooler to the touch, Lastly, an impact-resistant tempered glass lid allows you to conveniently monitor food without lifting. 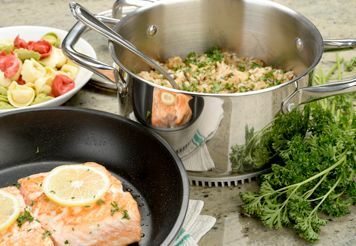 Turbo Pot® cookware saves an impressive amount of fuel and reduces cooking-related emissions of indoor air pollutants, like carbon monoxide (CO) and nitrogen dioxide (NO2). This is a smart way to keep your indoor air fresh and healthy, especially during winter months when kitchen ventilation may be minimized due to cold weather. By reducing fossil fuel consumption with every meal made, the FreshAir™ Casserole Pot helps to combat Climate Change and is a must-have for your sustainable lifestyle. Have fun, experiment, and enjoy new culinary adventures with the Turbo Pot® FreshAir™ Casserole Pot! Have fun, experiment, and enjoy new culinary adventures with the Turbo Pot® FreshAir™ Casserole Pot!